Come join CodeAcross 2015: a nation-wide effort in 60 different cities around the world for techies, civic enthusiasts, citizens, and engaged individuals to unite. RSVP requested, but feel free to come nonetheless. Come for the day. Help with challenges. Bring new ideas. Recruit for a project. Saturday, Feb 21, 9:30 - 4:30 pm. Code For America (at 9th Street and Howard). Breakfast and lunch will be provided. Please forward this to anyone who might want to join us. 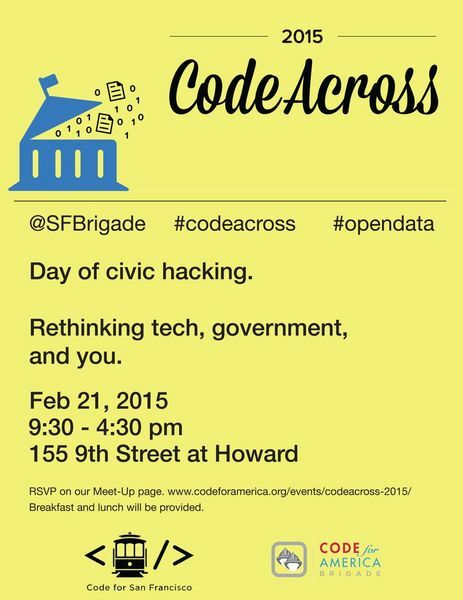 Our CodeAcross event will hold it’s leadership and participants to the Code for San Francisco Code of Conduct.